This beautiful apartment in the romantic city of Lille, France, has been completed to an exceptional standard by renowned interior architects Mayelle Architecture. The firm have taken a minimalist approach to the space, sticking to a simple, fresh colour scheme of black and white. The design maximises space and also ensures each room is filled with light so that it is as welcoming as possible. The quality of the individual elements, such as the wooden floors and the fixtures and fittings, really speak for themselves. Not only this, but the carefully chosen pieces in the living areas complement the style and mood of the design perfectly. It's amazing what can be achieved with only a limited colour palette. 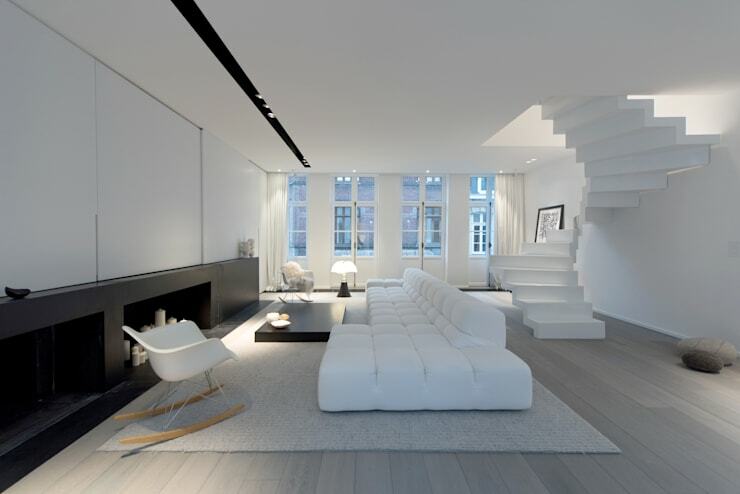 This spacious, open-plan room is testament to how elegant minimalist design can be: from the spectacular winding staircase to the simple and chic fireplace, every single element has been well thought out to create a seamless and harmonious design. The inviting couch almost resembles a cloud, floating just above the silvery boards of the wooden floor. The cool, light tones really open up the space, which is already a generous size. The French windows complete the room beautifully, flooding the space with light and adding an extra dose of charm to the interior. Thanks to the way the furniture has been arranged, the large room retains a feeling of intimacy and homeliness. The comfy couch faces the fireplace, which is filled with candles for a uniquely authentic touch. The contrast of the black bookshelf, streamlined coffee table and fireplace with the white walls and furniture makes the room dynamic. Simple but effective, the black and white colour scheme is fresh and tasteful and at no point does the space seem cold or unwelcoming, which can be an issue with minimalist interiors. A few personal touches, such as the quirky lamp and a framed print propped against the wall, provide us with an insight into the style and personality of the owners. In the dining area, the wooden slats resemble those we saw in the living room, which further establishes a sense of continuity in the design. 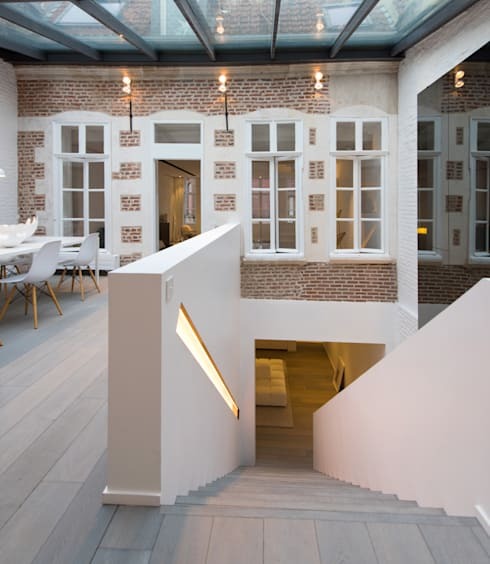 The lighting along the staircase, in combination with the wall lighting, introduces a warm and pleasant ambience. It's the perfect space for entertaining guests and sharing a nice meal together. In fact, the room almost appears to look like an outdoor terrace. The exposed brick wall with white window frames could well be an exterior wall and the view to the stars is only interrupted slightly by the support beams that line the roof. It offers a Mediterranean style dining experience whilst being protected from the elements. The kitchen has been designed in such a way to be extremely practical as well as beautiful. An integrated stainless steel hob is a focal point, which we're sure is a pleasure to cook on for the budding chef who lives here. 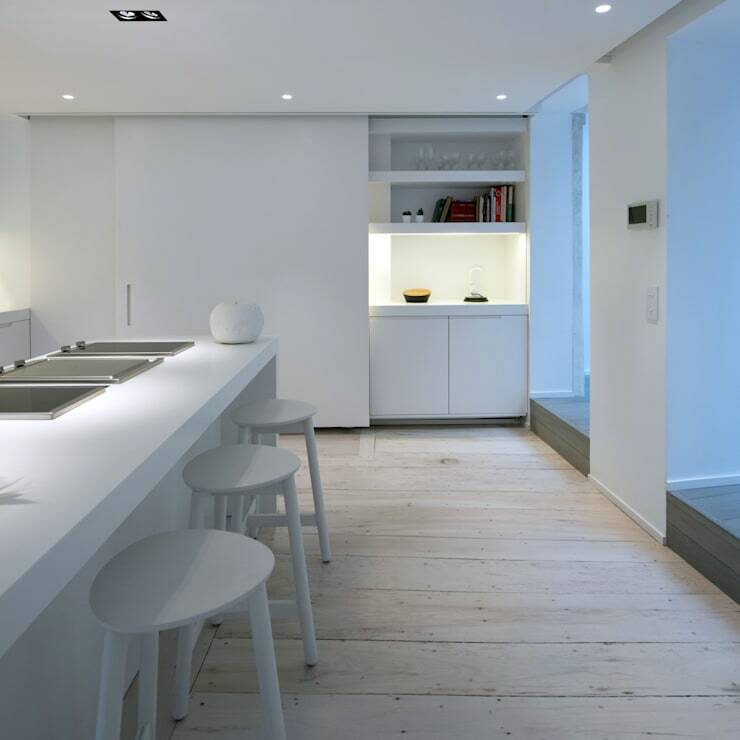 The sparkling white surfaces add to the aesthetic appeal of the room, with recesses and sliding doors creating a layered effect that gives the room personality. The wooden floor, which may well be birchwood, runs throughout the space, creating a Scandinavian feel that is very popular right now. Rather than seeming cramped, this small but sweet space is the perfect spot for relaxing and unwinding after a long day. 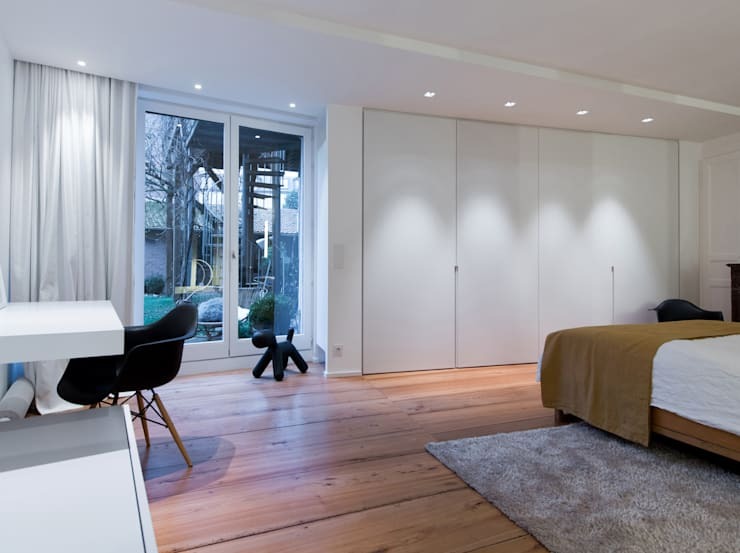 The bedroom has been kitted out with cleverly integrated storage, including a large wardrobe that blends in beautifully with the clean white walls. The backlighting is yet another clever way the designers have approached creating a sense of space and lightness in the apartment. However, the room also benefits from plenty of natural light thanks to the glass patio doors that look out to the garden. Overall, the room is the ideal place to catch a good night's sleep as there are no busy details or distractions—the focus is solely on respite and repose. We witness the same colour scheme in the smart and contemporary bathroom. 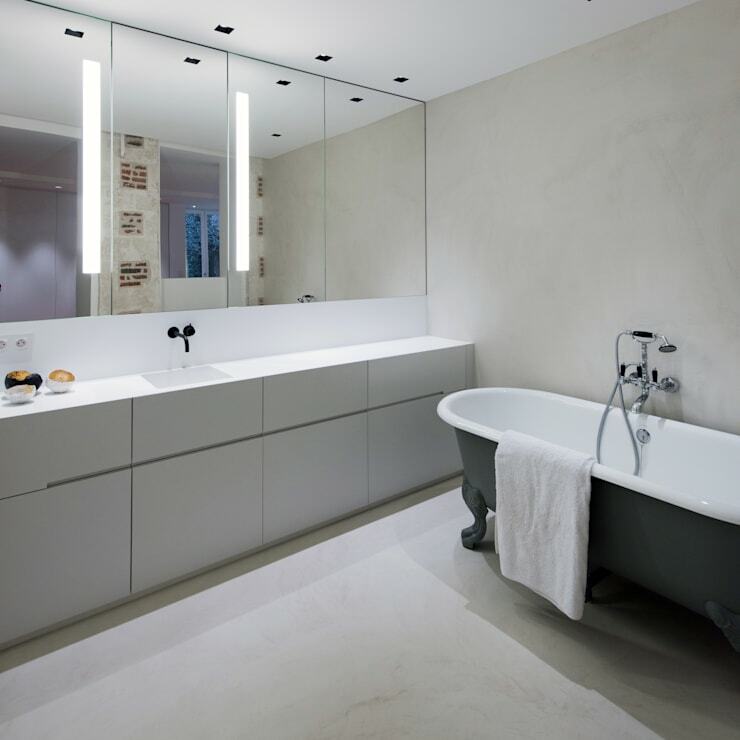 The freestanding bath adds another dimension, introducing just a hint of classic design to the otherwise ultra modern space. The integrated sink units hide away all the toiletries and essentials so that the room looks neat and elegant. The mirrored cabinets also work to achieve this effect, whilst simultaneously reflecting the light to make the room seem bigger and brighter. The attic room has been converted into a wonderful bedroom full of character and charm. A study area has been tucked into the recessed wall, with evenly spaced shelves stacked up to the point of this cosy nook. Contemporary chairs and accessories, such as the bedside lamp, are perfect finishing touches to complement the overall design. 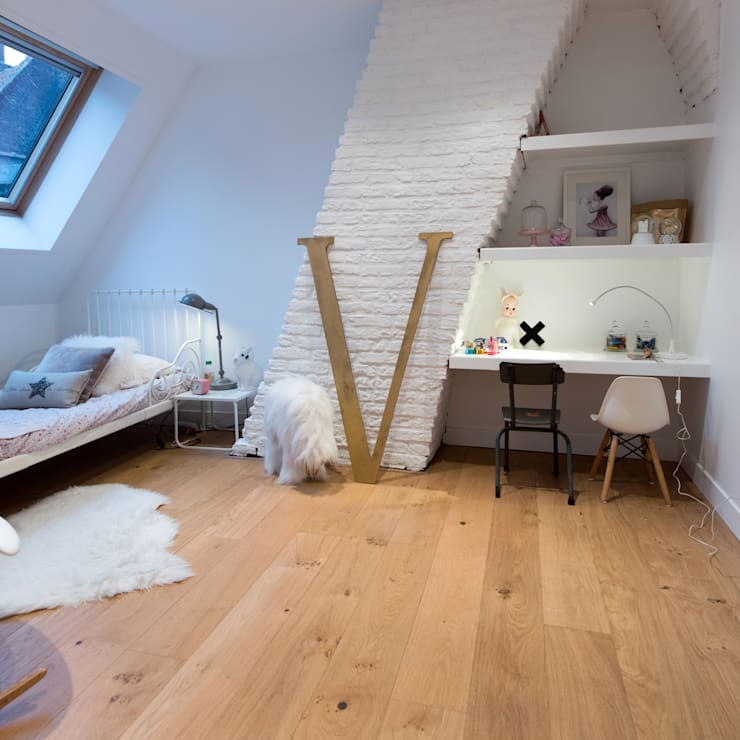 Though small, the space has been used wonderfully to create a truly enjoyable space for whoever gets to call this room their own. In the mood for another amazing contemporary residence? Then explore: The Modern Classic Home. Could you picture yourself living in the apartment? Is minimalism your thing? Share your thoughts with us in the comments!